A fun alternative to traditional bread stuffing! Start to finish in 45-60 minutes. 1. In a Dutch oven or other large pan, heat olive oil until shimmering. 2. Add shallots and sauté until golden, 5-8 minutes. 3. Add mushrooms, apple, and Arborio rice, sautéing until rice is translucent. 4. Deglaze the pan with sherry or broth/vinegar mixture. 5. Add dried spices and stir to coat. 8. Remove from heat and stir in ‘cream’ and nutritional yeast. 9. 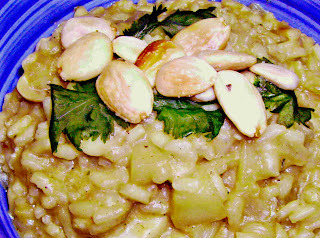 Transfer to individual bowls and top with parsley, nuts, and diced apple, as desired. I love risotto & this recipe looks and sounds very good. I loved this risotto. Sweet, fresh and creamy. Perfect. I'm definitely making it again.